In A GRANT OF ARMS (Book #8 in the Sorcerer's Ring), Thor is caught between titanic forces of good and evil, as Andronicus and Rafi use all of their dark sorcery to attempt to crush Thor’s identity and take control of his very soul. Under their spell, Thor will have to battle a greater fight than he has ever known, as he struggles to cast off his father and free himself from their chains. But it may already be too late. Gwendolyn, with Alistair, Steffen and Aberthol, ventures deep into the Netherworld, on her quest to find Argon and free him from his magical trap. She sees him as the only hope to save Thor and to save the Ring, but the Netherworld is vast and treacherous, and even finding Argon may be a lost cause. Reece leads the Legion members as they embark on a near-impossible quest to do what has never been done before: to descend into the depths of the Canyon and find and retrieve the lost Sword. As they descend, they enter another world, filled with monsters and exotic races—all of them bent on keeping the Sword for their own purposes. Romulus, armed with his magical cloak, proceeds with his sinister plan to cross into the Ring and destroy the Shield; Kendrick, Erec, Bronson and Godfrey fight to free themselves from their betrayal; Tirus and Luanda learn what it means to be traitors and to serve Andronicus; Mycoples struggles to break free; and in a final, shocking twist, Alistair’s secret is finally revealed. Will Thor return to himself? Will Gwendolyn find Argon? Will Reece find the Sword? Will Romulus succeed in his plan? Will Kendrick, Erec, Bronson and Godfrey succeed in the face of overwhelming odds? And will Mycoples return? Or will the Ring fall into complete and final destruction? 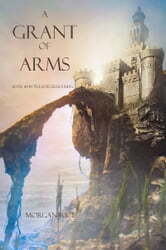 With its sophisticated world-building and characterization, A GRANT OF ARMS is an epic tale of friends and lovers, of rivals and suitors, of knights and dragons, of intrigues and political machinations, of coming of age, of broken hearts, of deception, ambition and betrayal. It is a tale of honor and courage, of fate and destiny, of sorcery. It is a fantasy that brings us into a world we will never forget, and which will appeal to all ages and genders. Books #9--#17 in the series are now also available! Unable to put this book down. Frustrating having to wait for the next book. Captivating and ingenious.